This post has been brought to you by Adult Video Blaster Video Marketing Tools for the Adult World. It is part of an Armada and was built to be used in war, but aboard the Daishan Dao or “Ark of Peace” there are no weapons but medical instruments. 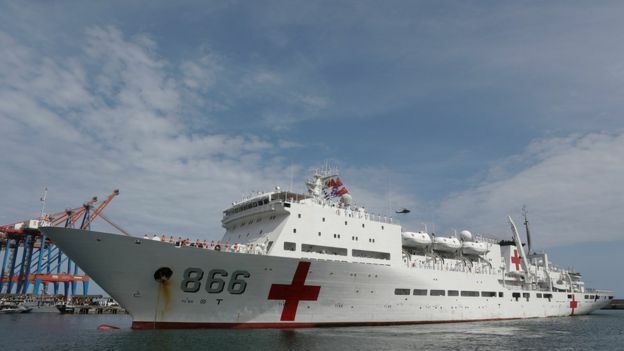 This modern hospital ship of the Army of China is anchored since Saturday on the coasts of Venezuela, where it will remain until next September 29 providing health assistance, as part of the cooperation between the Asian giant and the authorities of the South American country. Venezuela suffers a severe economic crisis that also affects health care services due, among other reasons, to the shortage of medicines and hospital supplies, as well as the emigration of thousands of professionals from the health sector. In Chile alone, the annual registry of Venezuelan doctors went from 70 in 2014 to 1,030 in 2017, according to figures from Chilean authorities. The visit of the “Ark of Peace” is part of the “Harmonious Mission 2018” tour, which began last June and includes among its ports of destination Colombia, the Dominican Republic, Ecuador, Papua New Guinea, Vanuatu, Fiji, Tonga, Granada, Dominica and Antigua and Barbuda. The ship will also travel to Chile to participate in the celebrations to mark the 200th anniversary of the founding of the Navy of that country. In the last decade, Daishan Dao has visited some 40 countries and given health care to more than 180,000 people, according to figures from the Chinese authorities. At 178 meters long, 24 meters wide and 35.5 meters high, the “Ark of Peace” is a unique ship. It has been in operation since the end of 2008 and was specifically designed and built with the objective of being used to provide medical assistance, something that sets it apart from the USNS Comfort and the USNS Mercy, the hospital ships that the US military sends to different parts of the world. humanitarian missions. The Chinese authorities identify it as a class 920 vessel. There is no other model. It is equipped with an ambulance helicopter, 300 clinical beds, 20 positions in the intensive care unit and 8 surgery rooms in which up to 40 complex operations can be performed per day. It has a crew of about 440 people, of which about 120 are doctors and nurses. “With the exception of internal organ transplant operations and heart disease treatment, virtually any type of treatment can be performed,” said Captain Sun Tao, then head of the ship’s medical wing, in 2014, to USNI News, portal of the Naval Institute of the United States. According to representatives of that website who were able to visit the ship, the Daishan Dao has extensive facilities for diagnostic examinations, with modern equipment including X-ray, ultrasound and computed tomography rooms. There is also a hemodialysis unit and a room for gynecological exams. “The ‘Ark of Peace’is designed to rescue and heal the wounded and sick at sea during the war. In times of peace, it performs medical services as well as humanitarian assistance operations. It also serves as a platform for the team to doctors train and conduct research, “Sun added in the interview. According to USNI News, this vessel also has modern equipment for communications and networking, which allows doctors to monitor patients remotely, as well as teleconferences with specialists located in hospitals in China. Another advantage of having been built specifically for sanitary purposes is that it has wide corridors to allow the comfortable transfer of the sick by the boat and that, in case of emergency, has special lifeboats that allow moving up to 18 stretchers in each one. “Harmonious Mission 2018” is the seventh international tour that makes the “Ark of Peace” in order to provide humanitarian medical assistance since it entered operations a decade ago. His first journey, in 2010, took him to five countries in Africa and Asia: Djibouti, Kenya, Tanzania, Seychelles and Bangladesh. A year later he was arriving for the first time in Latin America and the Caribbean on a tour that took him to Cuba, Costa Rica, Jamaica and Trinidad and Tobago. Then, in 2015, I would return to the region to visit Mexico, Barbados, Granada and Peru. Other countries he has visited are Tonga, Malaysia, Australia, French Polynesia, Sierra Leone, Gabon, the Republic of the Congo, Angola, Mozambique, Tanzania and East Timor. He has also been in the United States, participating in military exercises, and in Spain, where he made a technical stop in Malaga. “At the local level, the arrival of these ships is something well received because they provide medical services that the populations of those places could not get otherwise from their governments,” said analyst Alejandro Sánchez in an article on these health care missions published last January on the website of the International Maritime Safety Center (CIMSEC). “At the geopolitical level, these hospital ships carry out humanitarian assistance and disaster relief operations that are aligned with the overall strategy of their respective armies to help needy populations.” More so, and not surprisingly, these visits help strengthen the image of the country that deploys these platforms in the eyes of the government and the population that receives them, “he added. Thus, while providing assistance the “Ark of Peace” would also contribute – according to this analysis – to improve the image of China in the countries that receive it.